Science Minus Details: Why Pee is Cool - entry #2 - "Why Does Pee Smell?" or "Aroma of Life"
Why Pee is Cool - entry #2 - "Why Does Pee Smell?" or "Aroma of Life"
As you may know, after eating asparagus, your pee can smell pretty gross. 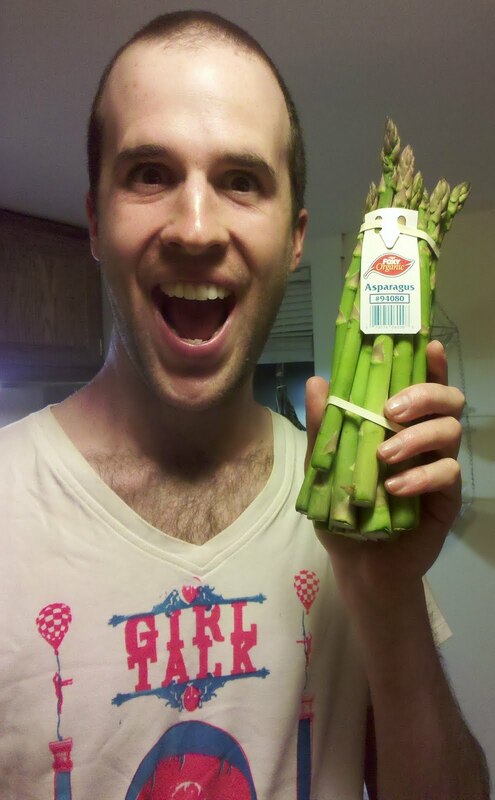 If you are confused by the above statement about asparagus-pee, fear not, there is a genetic basis for your confusion! Some people can smell asparagus-pee, while others can't, and this difference is caused by a difference in your DNA! This issue is not quite that simple, as not everyone produces smelly asparagus-pee after eating asparagus (awesome article here, awesomer article here). Regardless, if you can smell asparagus-pee, it smells because there are asparagus-pee molecules making their way into your nose! It's exactly like when you smell people's farts, molecules that were once inside their butts have made their way inside your nose! Gross! The asparagus-pee molecules that you smell come mostly from the breakdown of a molecule known as asparagusic acid, which is present naturally in asparagus. When your body breaks down asparagusic acid it forms a wide variety of chemicals, all of which contain sulfur! One dude eating asparagusic acid from asparagus and peeing out smelly asparagus-pee molecules (left). Another dude directly inhaling (not wafting, cuz he is unsafe!) those asparagus-pee molecules (right). Notice all the sulfur atoms! Many chemicals that contain sulfur atoms smell horrible in similar ways, and I have no idea why this is. This is one chemical/biological mystery that, much to my chagrin, remains unsolved in my head (internet people, if the reason is known, please help!!!). Aside from sulfur, the thing that all these smelly asparagus-pee chemicals have in common is that they are "light" enough (a.k.a. they are "volatile", which means they have a relatively low boiling point) that they can float up into the air and into your nose. That is partly why asparagus doesn't smell like asparagus-pee, because asparagusic acid is not volatile (remember that word). In fact, asparagusic acid boils above 300 °C (>600 °F), so there is no way any of it gets into your nose! Other nasty sulfur-chemical smells you may have encountered include rotten eggs, skunk spray, garlic bad breath, and natural gas. 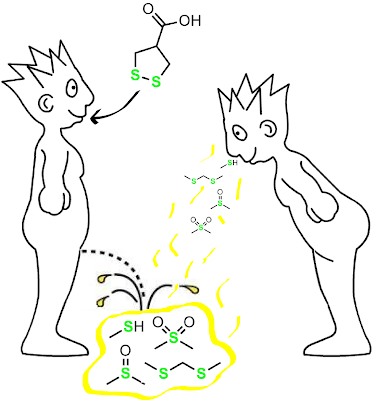 While there is no known advantage for humans to pee out volatile and smelly asparagus molecules, many other animals have harnessed the power of stinky sulfur chemicals for their own benefit. For example, cats pee out a sulfur-containing chemical known as felinine, which breaks down into a more volatile (and therefore more stinky) sulfur chemical. It is this more volatile chemical that gives cat urine its distinctive odor. Felinine and/or its smelly breakdown products are thought to play a role in attracting female cats to male cats so they can hook up and make babies. Many other animals use their pee in a similar fashion. In order to avoid different species getting their pee mixed up, different animals use slightly different chemicals, which causes their urine to smell pretty different! So simple! Side Note: Cat prey, such as rats, have caught onto this urine-related chemical signaling and run away when they smell these cat pee chemicals. The parasite known as T. gondii has in turn caught onto this. When this parasite infects a rat, it causes the rat to be attracted to instead of repelled by the smell of cat pee chemicals, and the rat is therefore more likely to get eaten by a cat!! This allows T. gondii to infect the cat, which is great for T. gondii because it needs to infect cats in order to reproduce sexually. Nature is amazing! If this interests you, definitely check out this radiolab podcast on parasites. Let's get back 2 basics though... let's talk about human pee and what we all have in common. The primary reason animals pee is to get rid of nitrogen atoms (more on this in future posts). We humans primarily use the nitrogen-containing chemical urea for this, though we also directly excrete small amounts of the very simple nitrogen-containing chemical called ammonia. Urea has no odor, mostly because it is not volatile enough to float into your nose. However, ammonia has a very strong odor, as this molecule is smaller and therefore more volatile than urea. 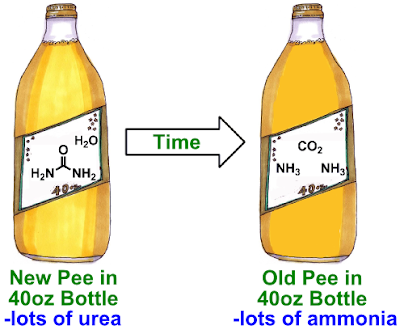 This is one reason why everyone's pee smells pretty much the same--because of ammonia. This is also why lant (aged pee, gross!!) smells worse than brand new pee, because the odorless urea molecules have over time combined with water to produce more smelly ammonia molecules. This happens on its own when urea sits around in water, but it can also be sped up by microbes that have an enzyme called a urease. However, even though everyone's normal, non-asparagus pee contains smelly ammonia, that doesn't mean it all smells exactly the same. The full answer to why pee smell varies slightly between people involves tons of details, but the simple answer is that everyone's body deals with chemicals slightly differently. This causes tiny variations in the volatile chemicals that are peed out, which leads to slightly different "pee bouquets". Some examples of the kinds of smelly chemicals we pee out in varying amounts include acetone (nail polish remover), benzaldehyde (almond flavor), acetic acid (vinegar), dimethylfuran, pyrrole, and even toluene (paint thinner)! Because subtle, ambiguous answers can sometimes be unsatisfying, we'll finish this post with two insane human biological disorders that are anything but subtle. Some people have the misfortune of urinating out a nitrogen-containing chemical called trimethylamine, which is the same chemical that gives dead fish its smell. Gross! This disorder is known as trimethylaminuria or "fish-odor syndrome", and is caused by the person's body not being able to turn trimethylamine into the less volatile (and way less smelly) chemical trimethylamine N-oxide. Trimethylamine therefore builds up in the fish-odor syndrome victim's body and comes out in his/her urine, sweat, and breath. What a bummer! We'll finish off today's peepee talk with a sweet tale. Instead of having dead-fish-smelling-pee, some people's pee can smell like maple syrup! This is caused by a genetic defect that causes a buildup in certain kinds of amino acids in people's bodies. 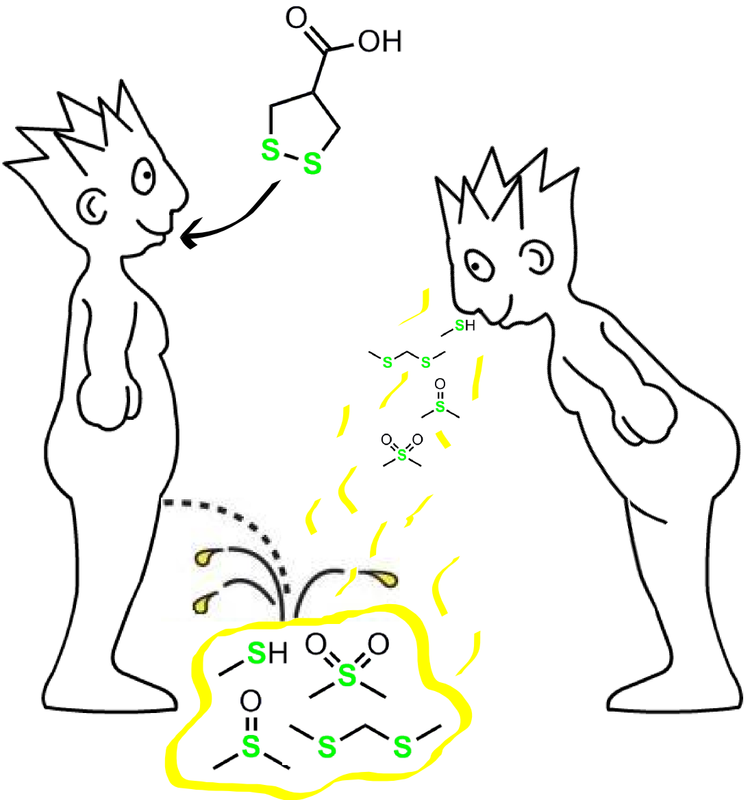 Those amino acids have to go somewhere, and some of them end up turning into a chemical called sotolon (proposed mechanism here), which then gets peed out. This is the same chemical that gives maple syrup its distinctive awesome smell, hence the maple-syrup-smelling-pee-pee! Unfortunately this disease can be fatal if left untreated (mega sad), however with proper treatment people are able to live healthy lives (mega happy). For the purpose of making artificial maple syrup, companies isolate sotolone from the herb fenugreek. So, since most sotolone molecules pass through your body unchanged, if you ever want your pee to smell like maple syrup, just eat lots of fenugreek. But remember, never directly inhale pee vapors, always waft! 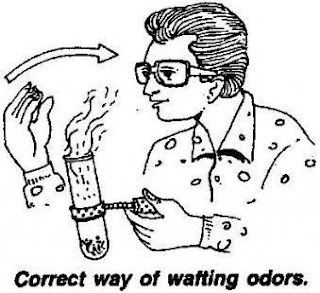 Alternative caption: Correct way of wafting pee with a severed hand. Stay tuned for more peepee posts! Leave comments if you have more questions about pee! PeePeePost #4: "PeePee Portal to Phosphorus" or "What the Alchemists Did Right"
Holy crap, that video of you wafting absolutely KILLS me. MEGA psyched you like it! When it comes to smelling pee, safety is my #1 priority! That rat parasite thing is crazy! Science is amazing.